theAd>> Unique wine server. 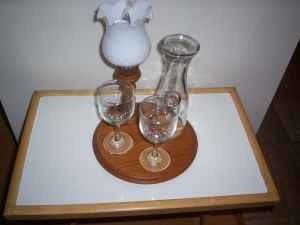 Beautiful teakwood circular platter with built-in cork coasters. One wine decanter, and two very delicate wine glasses. Also has a built in candle holder with frosted globe. Like new, never been used. Very unique. Great for display, or for a romatic encounter. I know I am always wishing I could find a way to signal to my partner that it is time for a romantic encounter. "Hooooooooney, I lit the wine server" That should get somthin' started. I DO question the wisdom of mixing drinking, fire and "two very delicate wine glasses" I guess the fun of having a couple of glasses of wine and trying to hit the little coasters while spinning the tray [I don't know if it spins, I am hopeful] makes the danger all worthwhile.